The last time I wrote about my work in the area of Perthshire was two years ago when my family and I carried on a long tradition of spending the Easter holiday away together. This year we returned to the same house to spend another fantastic week. It has given me a great opportunity to explore a small and specific area in more depth, something I wouldn’t have chosen to do had I been travelling up from my home in Glasgow. From my last visit I remembered a couple of spots I had thought worthy of revisiting on the hills above Butterstone. I thought this would be the obvious place to start the week. When I wokr on the first morning and peered out the window I was surprised to see... well... not very much. A thick layer of fog had appeared, obscuring the view down the valley. I ventured out anyway in the hope of capturing some atmospheric and moody photos. I could see a faint ball of light through the fog. I knew that if it were to break through the high layer of cloud and shine through the fog it would flood the valley below me with beautiful golden light. I also knew that if the sun were to appear it would cause me massive contrast problems. I frantically ran around the fields to find some sort of subject that would work with the conditions. I set my camera up positioning the sun behind a tree to partly hide the sun. I simply had to wait and hope that as the sun rose higher it would burn through the mist and light up the scene. Fortunately that was exactly what happened. As the fog began to burn off and more of the landscape came into view I finally found what I had been looking for. Two years ago I found this old derelict farmhouse but hadn’t been able to make a picture of it but now conditions were perfect. I was able to capture the moody and misty photo I had hoped to. As the sun shone through the layer of mist it created beautiful, ethereal colours with subtle streaks of light across the maze of stone walls that were draped across the farmland. The remainder of the week was fairly bleak - weather wise. Apart from the fantastic session on the first day I had struggled to get any great photos. One morning towards the end of the week, as I woke early to complete the daily peek out the window I saw the usual low cloud and flat light; a half hour later the same conditions cursed the view. Another hour after that and I was ecstatic to see that the scene out of my bedroom window had completely transformed! I was lucky enough to have the loan of my dads super massive 600mm telephoto lens. With this awesome toy (finally) in my arsenal I quickly gather my gear and ran out the door. I spent the morning trying to pick out details in the landscape. Besides the awesome time I had photographing this little area, and despite the weather hindering me taking any more photos, the week was a special one. Its always special to spend time with family, and I'm so fortunate and grateful to have a family, every one of whom cares enough to travel (in some cases) the entire length of the country to spend time together. But this week was special in a different way. It was during that first holiday to Perthshire, when I spent the whole week driving around, exploring everywhere I could, that I vividly remember thinking how easily I could see myself living and working in this area. So to return two years later, having come full circle - still gives me goosebumps! Devon - Summer Ends With A Bang! This summer has been an amazing few months full of travel, photos, camping and adventures. After an exhausting adventure in the highlands of Scotland last month I was looking forward to a week in a warm comfortable flat, with a bed, a great view decent meals and a shower! My parents were on holiday in the harbour town of Brixham, in Devon, and offered me a free bed as a chance for me to tick off another location on my list of places to shoot. I didn't plan on going out with my camera the night I arrived, but after a little persuasion I joined my mum and dad on their evening walk down to the harbour. It was only a 10 minute walk from the flat to the start of the breakwater and by that point the sunset was in full swing and I had to rush to get set up. It always feels good to get a decent start so early on in a trip. The following day I was ready and rearing for a day exploring Dartmoor and finding all the locations I had spent the previous weeks researching. The first thing that struck me about Dartmoor was how vast it was. It took me the whole day to find just a couple of the locations I had researched. That night on our evening walk I decided to stay nearer the harbour. It turns out that was a good call! The sun disappears quite early on in the evening behind the steep, crowded slopes surrounding the harbour which made it seem to me that the sunset is over in a flash! I was able to capture just a few photos before the colour in the clouds vanished. Once the sun had set I stayed behind with my dad to wait for the lights of the town to bring the place to life. For the next hour or so I hung around the harbour as my camera made its long exposures. I was able to make the best of the “blue hour” that comes at twilight. The next days forecast for Dartmoor was still poor. I decided that my best bet would be to stay in Brixham for the sunrise. I was quietly relieved that I didn’t face a really early start. At the breakwater I kept an eye on the horizon, looking for the sun. Some light cloud picked out some lovely colour and I was able to capture this set of photos looking out to sea. These images really capture the peacefulness of the morning. As the morning went on and the sun grew closer to the horizon, I turned my attention towards the marina. The stillness of the water made some great reflections of the boats and the clouds. The colour in the sky was certainly getting stronger every minute, but I love the subtlety and muted tones in this shot. When the sun was up, I started to make my way home but I couldn’t just walk past this shot of the town. I felt really pleased to have had a positive start to the day and felt good about going out later to find more locations on Dartmoor. Little did I know that soon, everything was about to go horribly wrong. When I set off in the car later that morning I didn’t even make it onto the moor before disaster stuck. I’m not sure what exactly I hit, maybe a rock or a piece of stray farm equipment on the road, but all of a sudden I heard a loud “pop” and felt my car start to wobble. After several hours of waiting with the police for a recovery van, one badly dented alloy and a ruined tyre, I was finally on my way again. Long story short, I had lost a full day of exploring Dartmoor. Feeling pretty deflated and frankly fed up, I collapsed at home at the end of the day with no intention of going out for yet another sunset of the same harbour I’d been at every day since I arrived. That said… with a bit more persuasion I found myself out with my dad, above the harbour waiting for the sunset. And once again, it turned out to be worthwhile. I had to remind myself that it’s when things go wrong that you need to dig deep and make the most of every opportunity, otherwise you'll regret it. Even though I still felt pretty unenthused about going out with my camera, I dragged myself out of bed the next day and along the coast to Paignton for a sunrise shot of the pier. The sunrise turned out well with some nice golden light, along with the bonus of a kayaker and swimmer in the sea to add some interest to my photos. But more importantly it helped me feel revitalised about my photography. I spent the remainder of the day at Paignton zoo with my parents. It was frustrating that it had taken so long to find the shots I was looking for. But the following day, with a bit more enthusiasm, I was able to really sink my teeth into Dartmoor and was able to find the remaining locations on my list. 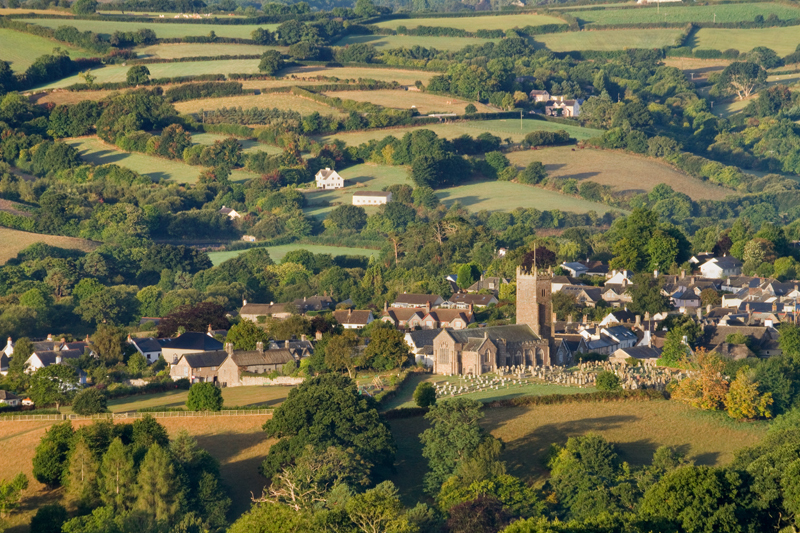 I had been looking for a village surrounded by fields with a church steeple rising above, and that was exactly what I found at Moretonhampstead. It had been bright and clear all day but the evening turned out extremely hazy. I chose to leave early for some well needed dinner and try some shots in the morning. 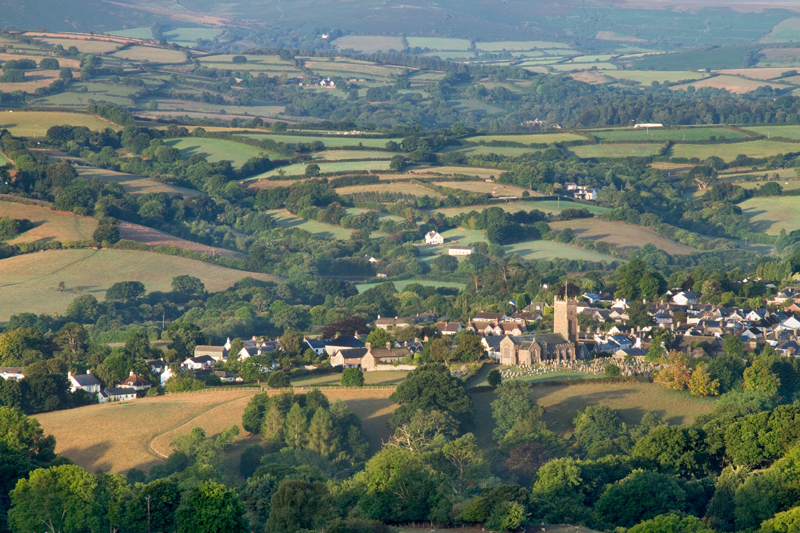 I knew that the shot I wanted required the sun to be up and shining on the village so I decided not to get there long before the sunrise as I normally would, and gave myself some extra time in bed. I got my hopes up on the drive out when I passed through several stretches of lovely morning mist. Unfortunately, when I got up the hill overlooking the village there wasn’t enough mist to create the sort of effect I was hoping for. After a while the sun began to peek over the hill behind me and I was able to capture the pictures I’d been after all week! By this point it was apparent that I wouldn’t have time to shoot all of the locations I had planned to, but I was happy with the places I had left to try. So that afternoon I went along the road at my dad’s recommendation to Goodrington. The beach at Goodrington is lined with some quintessentially picturesque beach huts and also one very unique feature - a steam train! The last day of my trip was a bit of a washout but I wanted to make the most of the last sunset before I went home. I had to decide between the two Tors that I had scouted earlier in the week. I made the decision to go up Cox Tor and photograph the array of wind swept Hawthorn trees that are strewn across the hillside. Traffic had really held me up and I had to rush to get into position. The cloud blocked out most of the sunlight for the duration of the evening but I was able to make some dark and moody images of the battered trees. It wasn’t the grand finale to the week that I’d perhaps hoped for but I’m actually quite pleased with the final results. Whenever I go away on a trip like this I always try to find a few locations that would work well in poor weather conditions. These are normally woodland areas under a lot of cover or waterfalls. For this trip, that shot was Hisley Bridge – a small stone bridge over a river in a nice wooded area. Perfect. This summer has been an incredible adventure. I feel privileged to have been able to spend the past few months travelling to some of the most beautiful parts of the country. I’ve had an exhausting and extremely trying time, but it’s overwhelmingly rewarding. What’s more is I’m feeling even more enthusiastic about my photography than ever. I can’t wait for autumn to arrive!